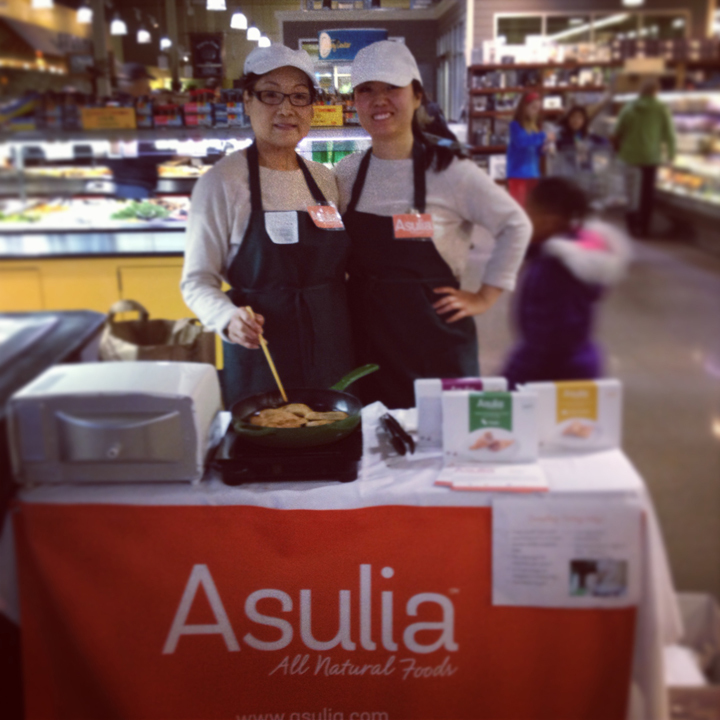 I packed up Asulia dumplings last Saturday (1/11/14) for our very first demo at Whole Foods (WF) with my mom. Every team needs a uniform, we wore wheat-colored sweaters, kale green aprons, and special name tags. When you’re a vendor at WF, you need to bring everything with yourself and take everything with you when you leave, so it requires a lot of preparation. The night before, I made a last minute run to find a skillet. After trying a few options, I recently got an induction cooktop for tasting events like these. They heat up in seconds, so they work really well for heating up our frozen dumplings. However, you need induction-friendly pots and pans. I thought my stainless steel skillet would work, but when I tried it out the night before, I realized it was a no go. So off I went in search of induction-friendly cookware. While other people were heading out for Friday night fun, I was heading to Marshalls! I had just an hour before they closed and found a great cast iron skillet, which is great at conducting heat. On Saturday, we were up early. 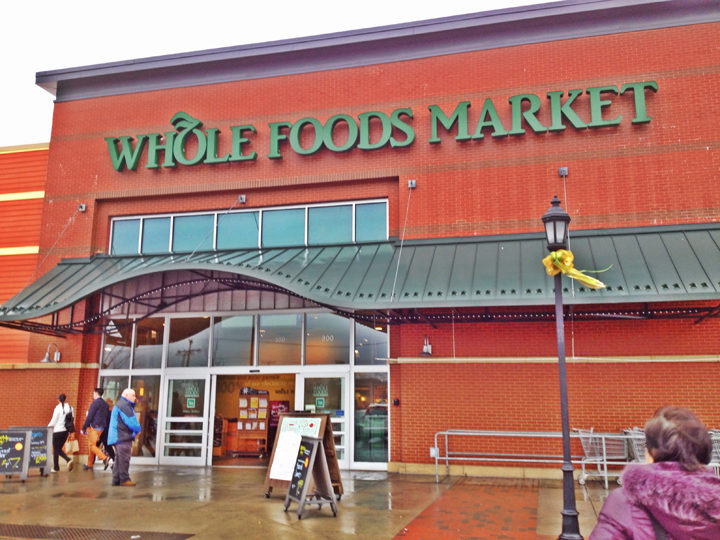 I saw that it was rainy and cloudy and wondered if that would keep people at home, but fortunately WF shoppers are not afraid of the rain and the Dedham store was packed. First things first. Before setting up, we had to make sure that enough boxes of dumplings were on the shelf in the freezer case. Check. Next, we got our table and display all set up, but our electricity kept cutting in and out. So, we loaded everything into a shopping cart and setup shop in our second location, dodging WF customers as we wheeled through the store. The electricity went in and out at our second location too! 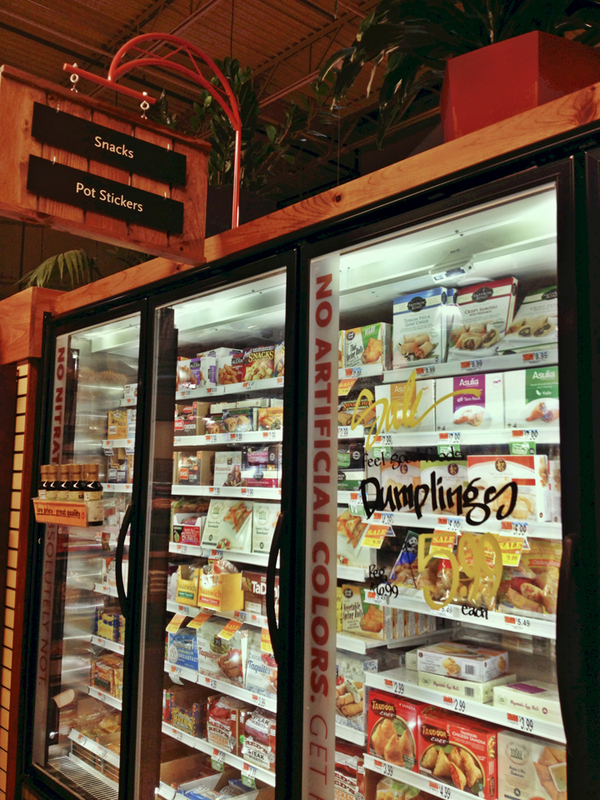 Finally, with the help of some really great team members at WF Dedham, we got hooked up to the power source at the hot bar and could resume heating up our chickpea, kale, and taro root dumplings. We shared hundreds of dumpling samples nonstop for 3 hours, to all kinds of people, young and old. We were so busy that as soon as one batch was ready, another line was already forming. Our suggested and preferred way to heat up Asulia dumplings is in an oven, but we can’t seem to heat them up fast enough at tastings. This is why I switched to an induction cooktop. I love seeing people’s faces when they first taste our dumplings. Of course we talked about our mission, vegetables, and healthy eating, but we also talked about other things, what they were shopping for, families, holidays, the Patriots game, personal stories, things going on in people’s lives. I find that food is a connector, and I love that. Afterwards, we were exhausted and ecstatic at the same time. My mom and I had a late lunch at WF and of course picked up a few items. It’s hard to leave WF empty handed! For me, the experience was super surreal. It’s a true milestone for me. I’ve spent countless nights and weekends bootstrapping Asulia, taking it from a dream to reality. 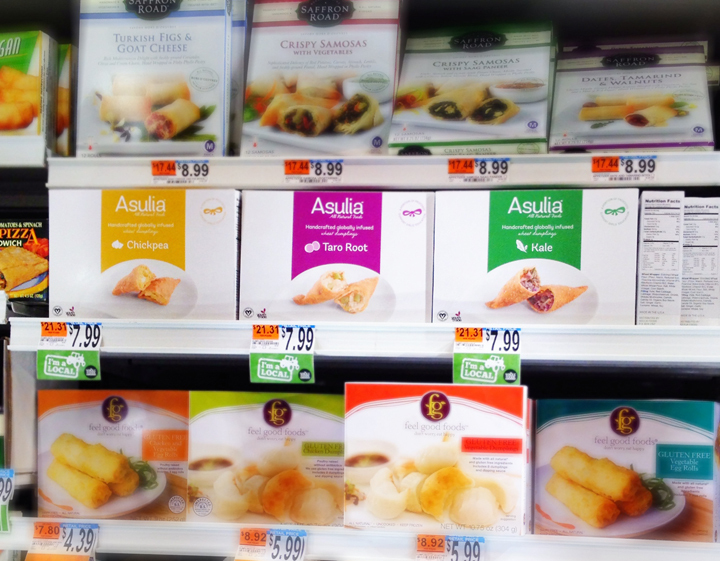 When I see Asulia boxes on the shelf at Whole Foods, I’m seeing my dreams of helping people eat healthier and helping to send more girls to school come true. I love my job! Many thanks to the team at WF Dedham! We couldn’t have pulled it off without you. Stay tuned for future events by signing up for our e-news, follow us on Facebook, Twitter and check our events page. We look forward to eating dumplings together soon!